Department of Art | Celebrate the 60th Anniversary of Building Spring House! 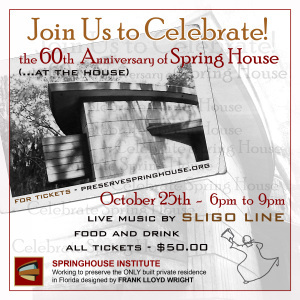 Home » News » Celebrate the 60th Anniversary of Building Spring House! Celebrate the 60th Anniversary of Building Spring House! This even will take place on October 25th at 6pm-9pm. Live music will be performed by Sligo Line, and all tickets for entrance are $50.00.